Last time I posted about the Pursuit of Excellence the goal to work on was Develop healthy eating habits and patterns. I hope everyone has been working on their goal. Here is the link to the Pursuit of Excellence pamphlet. Freely forgiving others and Learning to repent daily. So, these are actually two separate goals in the Pursuit of Excellence program. I think that they can go hand in hand. I chose these two goals, because they are very important and close to my heart. I recently, went through a situation where my husband was upset and I was hurt, I didn't know to bring the harmony back. Then, I did a Family Home Evening on Showing Love, Appreciation and Respect to Family Members and Building a Happy Family. In putting the Family Home Evening together I was impressed by the page on Lds.org titled, "Happiness in Family". Learning how to freely forgive others. The main headline on the Forgiveness page says, "Knowing how imperfect we are, surely we can extend healing forgiveness to those we love. 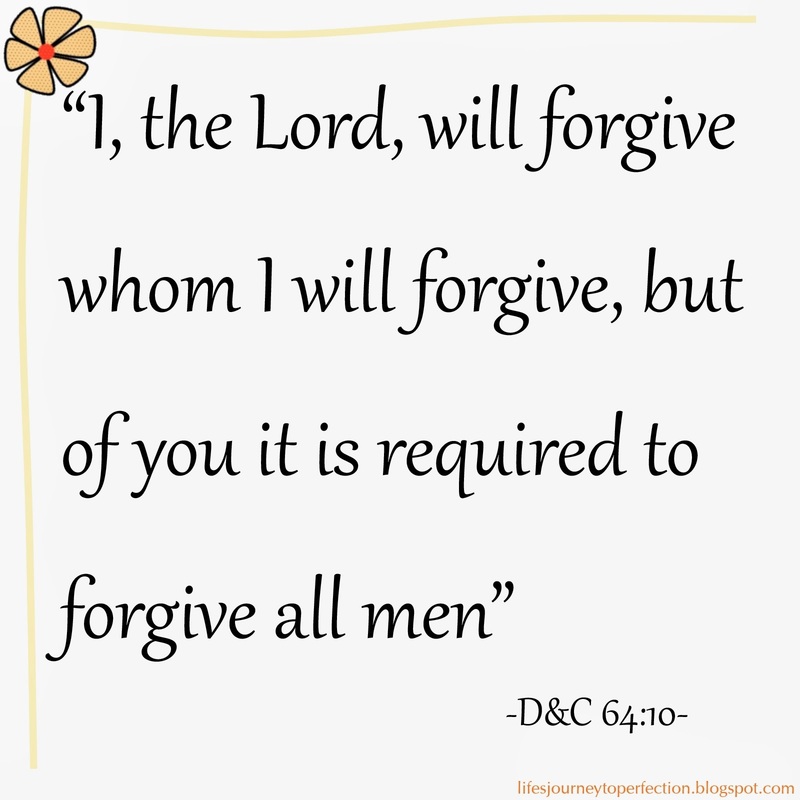 Jesus said, “I, the Lord, will forgive whom I will forgive, but of you it is required to forgive all men” (D&C 64:10). Comfort and sweet peace will live in our homes when we forgive each other freely." I came to the understanding that I am required to forgive freely, meaning even if someone does not ask for my forgiveness, I am still required to give it. I can testify of the "comfort and sweet peace" that comes from this. When I focused on my own faults and was able to freely forgive my husband of his, I felt my Heavenly Father's love. I knew that I did my part and that everything would be okay. I was truly at peace and the situation seemed to resolve. I became closer with my Heavenly Father and my relationship with my husband was strengthened. I usually do not give such personal information, but I feel that the topics of Repentance and Forgiveness are so important in every relationship, whether it be in the family, with neighbors, or fellow church members. When we become more focused on our own faults and seeking daily to repent of them and then freely forgiving others of their faults, our lives will be blessed. We will be released from the entrapment of bitterness, helplessness and sorrow. We will feel peace and the unconditional love of our Father in Heaven.